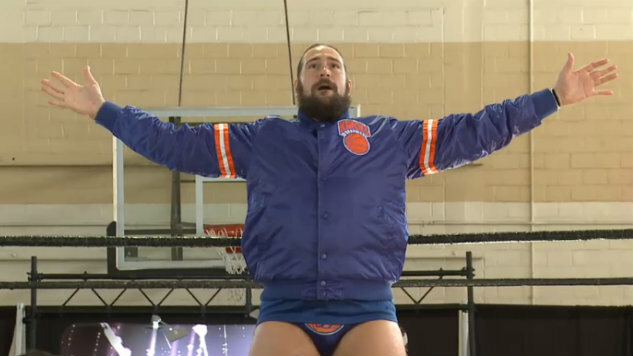 About five minutes into what was to be Chris Hero’s second-to-last match on the independent scene Saturday, the top rope snapped. Hero and opponent Keith Lee were going back and forth running the ropes, when Hero simply fell backwards, grasping at his head. It was the second time during Evolve 76 that the ropes would break—a similar mishap happened earlier, in a match between Jaka and Peter Kaasa—and incredibly, it wasn’t the last. The incident threatened to ruin a weekend honoring the man who gave 18 years and roughly 2,000 matches to professional wrestling, and worse, could have led to a serious injury. But what should have been a disaster quickly turned around: After just a few moments for Hero to collect himself, the match continued anew, with the two men scrapping whatever plans they made for an entirely new situation. Thinking on their feet, the fight continued out on the floor, the two men trading clubbing blows. Hero turned to referee Brandon Tolle and demanded there be “no count-outs.” A few moments later, with Lee on the ground, the quick-witted Hero returned to the ring and gestured to Tolle. “Hey!” he yelled at the referee, while pointing towards Lee. “Count-outs!” It was a small touch, in a match that illustrated the tremendous ring acumen of Hero. It’s impossible to exaggerate just how much Chris Hero meant to independent wrestling throughout his nearly two-decade career. From his legendary battles with CM Punk in IWA Mid-South, to his role in the CZW “invasion” angle of Ring of Honor, to his work with the Kings of Wrestling, through his rebirth after his first NXT stint, Hero has constantly been one of the smartest, most innovative wrestlers in the world. And nowhere was that more apparent than Saturday night in San Antonio against Lee. Whatever the two men thought they were getting into Saturday, this was not it. At one point, Lee tried to use the remaining middle rope to perform a moonsault. That, too, ended in near-disaster, when another rope snapped, and Hero, who was trying to roll underneath Lee, ended up with a few hundred pounds tumbling right on top of him. Still, they pushed forward: They got up, and Hero’s rolling elbow was turned into a massive elevated sit-out powerbomb. And when the unexpectedly strong match was over, Hero got the win, and Lee came out of it looking great in his first Evolve-contracted match. Last year was arguably the best of Hero’s career, and it paid off, with a new WWE contract and a second chance at a much-deserved payday. Hero’s independent wrestling career officially came to an end Sunday, in a loss to Zack Sabre Jr. and a locker room send-off. And he’ll get his chance to succeed on a big stage with WWE. But remember moments like Saturday, because those qualities—adapting to unpredictability, the ring smarts to make something out of nothing— illustrate the true greatness of Chris Hero.